While everyone may have a different reason for thinking so, the general consensus is that 2016 was a pretty awful year. The one bright spot is that it’s now 2017, and we all have the ability to start fresh to outsource your digital marketing. The overarching goal of most businesses is to grow and expand, but especially when it comes to marketing, many find themselves without the time or resources necessary to figure out the most effective digital strategy for their particular company. You can try to do it all yourself but you can run the risk of not performing well or potentially harming your business if best practices aren’t being followed. That all takes time. Hiring an agency to oversee your marketing operations is no longer only within the realm of large-scale enterprises, and there are a number of advantages to doing so rather than trying to get everything done in-house with limited staff. Here are some key reasons to outsource digital marketing efforts, and make 2017 the best year yet for your business. Let’s get the obvious out of the way first: when you outsource your marketing efforts, you are gaining the immediate benefit of an agency’s knowledge. A great agency is not only up to date with marketing technologies and how they can help you reach your goals, they also have experience in doing just that for other clients. There are many, many subcategories of digital marketing that could be considered specializations (PPC, SEO, and social media, just to scratch the surface), but the best agencies can identify where you should spend your money to have the greatest positive effect on your bottom line. Think of it this way: a well-known auto manufacturer wouldn’t spend money on a local access television commercial. By outsourcing your marketing, you are putting it in the hands of people who know where your greatest audience is, and how to tap into and grow that base. If an agency has worked with other companies in your field, so much the better, because they have experience in driving the kinds of results that you want to see. In general, digital marketers are all about identifying key opportunities to increase your lead funnel and acting on those opportunities, guaranteeing a return on investment. Outsourcing your marketing also means that it is removed from your company’s day-to-day, which can be a net benefit. It allows a team or agency to come up with ideas that are not impacted by the normal operations of the company, and you get to focus on what your business does best. One of the biggest keys to successful marketing is consistency, but given that your employees are human like you, they are going to need to go on vacation every so often. Outsourcing minimizes the impact that staff absences can have on marketing efforts, such as content production, where going a week or two without can have major ramifications. Additionally, as you’re working with an outside party, you have the ability to gain insight not only into the inner workings and changes of the digital marketing landscape, but key external observations about your website and other marketing processes, which you can then use to your advantage. Lastly, but perhaps most importantly, outsourcing is not a one-and-done proposition. A digital marketer or agency should be continually optimizing your marketing efforts. With increased optimization comes a much lower risk of stagnation, as marketers will always be trying new and different things in order to deliver on your agreed-upon end goals. If you want to make 2017 a year your business will never forget, irrespective of how much time or staff you have, there are few better ways than to outsource digital marketing efforts. I have proven experience with multiple channels, including Search Engine Marketing and social media marketing, make me the perfect partner for all of your digital marketing needs. 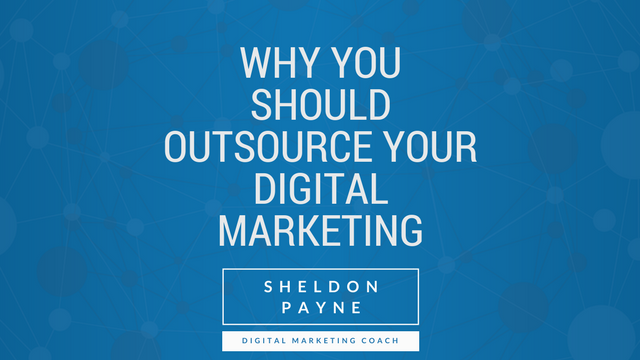 One Response to "3 Reasons Why A Business Should Outsource Their Digital Marketing"